*To make arrangements for check-ins before 1 pm and after office hours please call ahead. If you do not make prior arrangements then you may not be able to access your site until the following day. *CANCELLATIONS: Sorry, no refunds. At your request we can move your deposit to an alternative date one time the during the current camping season. Call (802) 885-2889 or for reservations scroll toward the bottom of this page. Reservations can be paid by mailing a check to 53 Skitchewaug Trl., Springfield, 05156 OR by credit or debit card with Square Invoice sent to your email, (there is a $3 processing fee. VISA & MASTERCARD accepted). 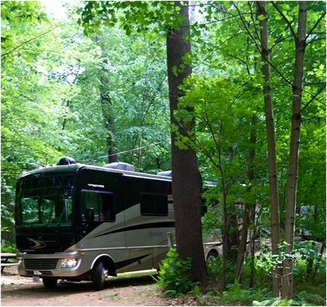 PLEASE NOTE THAT OUR CAMPGROUND IS FOR RECREATIONAL, NOT RESIDENTIAL USE. ALL Fees are for 2 Adults and up to 4 children under 15. Additional fees apply for extra guests. RV Site up to 40ft (water, electric with 20, 30, 50 amp service, sewer and Cable access and FREE WiFi signal): $38.00 per night. sorry no special monthly rates available. Seasonal Rate: $1900. all inclusive plus $300 security deposit. 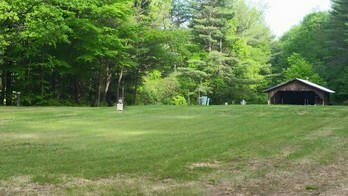 Green Acres Field (for group camping): RVs $29.00 Ask for details for tent rates. 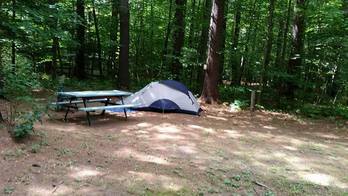 Camping sites in the field have limited electric, water and septic hook-ups. Not all sites are full hook-up. 12 Picnic tables inside the Pavilion, 2 picnic tables in the field area, men's and Women's restrooms, lighting, a community fire pit, charcoal grill, and ample parking. All events/parties must be cleaned up and end by 9:30 p.m.
$1900 All inclusive/full hookup plus $300 security deposit (new seasonal) Price includes parking camper on your selected site from May 10-October 19th ($150 extra to park through winter), cable access (sorry limited to no satellite reception within the forest), wifi, electric, water, septic, trash and recycle removal. $300 security deposit will be returned if/when guests are no longer a seasonal and are in good standing with Tree Farm Campground. You must complete the form below to make a reservation, we will contact you via e-mail to confirm your reservation. This is NOT an automated reservation form. Please note that it may take us a moment to confirm your reservation as we are often assisting customers and can't get to the computer right away. Please be patient, we will contact you as soon as possible. We thank you for your understanding. ($38 or $26 or $76 for a weekly or more. See Rates). Deposit checks only accepts up to 7 days prior to arrival date, credit card will be required for a deposit less than 7 days before arrival. ​OR Please indicate if you'd like to pay your deposit Visa or Mastercard. IF YOU HAVE QUESTIONS OR FEEL THERE WAS AN ERROR WITH YOUR RESERVATION PLEASE CALL US AT 802-885-2889. IF WE ARE UNABLE TO ANSWER PLEASE LEAVE A DETAILED MESSAGE ABOUT YOUR RESERVATION.